50s Westerns DVD News #159: The Lusty Men (1952). | 50 Westerns From The 50s. « The Official Beverage Of 50 Westerns From The 50s. 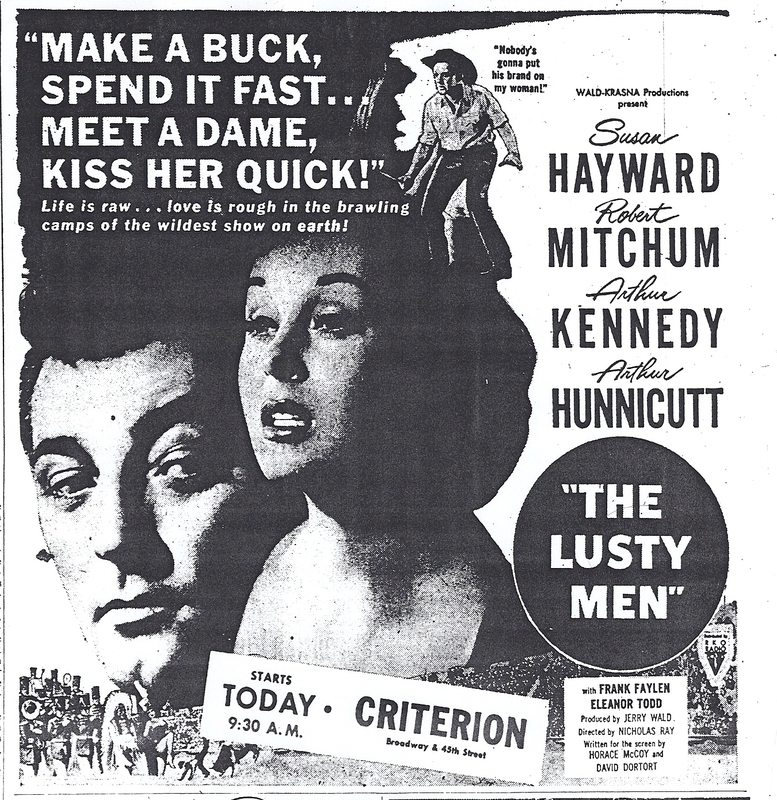 50s Westerns DVD News #159: The Lusty Men (1952). Robert Mitchum often dismissed his work, but this was one he had nice things to say about. Ray gets a terrific performance out of him, and he does the same with Susan Hayward and Arthur Kennedy. They say shooting began while the script was still being worked on, and that many scenes were worked out on the set as a result. However it all came together, it’s one of Ray’s and Mitchum’s best films. And that’s saying a lot. Highly recommended. This is one of the handful of films I’ve held onto my laserdisc of, and I guess it can be retired now. Thanks for the tip, Paula. My mother, Carol Nugent, is in Lusty Men as a young girl! She’s in all kinds of cool stuff, including one of my all-time favorite movies, Trail Of Robin Hood. Yeah. As you and a few other folks here know, this is one of my favorite films of all time. In truth, it is one of only three that have traditionally made my list for many years now, the others being THE SEARCHERS (1956; John Ford) and GERTRUD (1964; Carl Dreyer). It was one of the few laser discs I ever bought (without ever getting a player!) and so had a good copy made from that. I just saw it again for my birthday this year–the age I came to made me feel it was a good time to get back to it. I could not begin to evoke the myriad beauties and profundities of this movie, which I’ve written on several times and don’t feel I’m finished with yet because as many times as I’ve seen it, I got still more out of this last time. However, to commemorate the occasion, I hope you won’t mind if I put my entry from DEFINING MOMENTS IN MOVIES into a separate post. This is about the uncommonly beautiful opening of the film, and especially about Robert Mitchum, on whom the sequence especially depends. I’ve got to get out of this to copy it so hopefully it will be here in a few minutes. allysunshine, your mother is absolutely wonderful in the movie as Rusty–a very important role. Athough she was a young girl, it seems to me she had to have a real sense of what the whole thing was about to carry her part of the drama, which she did beautifully. Susan Hayward! Say no more, this one has been on my list for a long time, thanks for the heads up. Checked her out once again in a fairly recent release called Untamed. It’s “kind” of a western, at least in feel, and a really good film. Of course you have to see her in the excellent western films “Rawhide” and the under appreciated (IMO) “Garden of Evil” with Gary Cooper and Richard Widmark and a great Bernard Hermann score. I don’t have a laser disc of this but I do have a colorized version. I remember when watching it I was surprised it was a “modern” western with cars and it was about a rodeo as I recall. This is the piece I mentioned earlier today. Sorry for the delay. I was rushing out earlier and thought I had posted it then. USA. Director: Nicholas Ray. Cast: Robert Mitchum. Why It’s Key: In a memorably reflective opening, one of cinema’s greatest directors works with one of its greatest actors to fully create a character in the most gracefully restrained way. One of the most beautiful openings of any film introduces the character of rodeo cowboy Jeff McCloud (Mitchum). Unusually, he is first established in a documentary evocation of a rodeo, without dialogue or interaction with other characters. Injured by a bull, Jeff leaves the rodeo grounds alone and hitches a ride to a place that we come to realize was his childhood home; for awhile, he is by himself there, then his solitude ends. In tone and texture, Ray’s images are highly evocative: Jeff’s limping walk across the arena at dusk amid papers blowing in the dimming light, the morning glow over the countryside as he walks toward the ranch, his look at the house from the gate, his crawl under the house to find some things he left there years before. So is the soundtrack: Roy Webb’s score begins discreetly when Jeff gets out of the truck, its wistful main melody first appearing when he is at the gate. The most important element, though, is Mitchum, who has the rare gift of knowing how much emotion the camera will pick up and how much it is up to him to convey, in his body as well as his face. People express emotion more quietly when they are alone, and the emotion here is profound, especially Jeff’s first look at the house from the gate, and his expression, almost like that of a little boy, as he looks at his things. As these scenes end, a rich drama will begin, but we have already seen what the film most deeply is – a meditation on one man’s sense of the circle of his life. Good stuff, Blake. I’m really looking forward to seeing this again. What your comments here, and some of the others from other folks, has me realizing, is how visual this movie is. And your point about Mitchum knowing what will register on the screen is dead on. He and Gary Cooper were both so good at that. on September 12, 2014 at 4:06 am | Reply Waylon J.
Mr. Mitchum’s walk is worth watching this movie for. It is so stylish and a role model for any man to imitate. I hope the Dvd is released very soon. Tuesday’s the day, so you won’t have long to wait! I would just like to add my appreciation of the marvellous movie THE LUSTY MEN. Everything just blends together. The fine characterisations borne out of the acting of ROBERT MITCHUM, SUSAN HAYWARD and ARTHUR KENNEDY, the perceptive direction of Nicholas Ray and the intelligent screenplay by McCoy and Tortort make this an exceptional film. Thank you Warner Archives for bringing it to dvd newly remastered. Beautiful writing Blake, you can tell you really appreciate the art of film making. and RINGO AND HIS GOLDEN PISTOL. A GUNFIGHTER as it also headlines Russ Tamblyn. character actors is also stellar. programmer Westerns that I’ve never seen. Lovely cover art too! then went on to Euro Westerns and adventure films. LONE SURVIVOR is one of his recent smash hits. Time to get the old pasta on the go! ‘cos I always thought these Euro flicks were shot in Techniscope. is like RIO BRAVO but not as good! As a correction to the above YOUNG GUNS is from 1956. Sony, Fox and Universal are you listening!